Belmont’s School of Nursing (SON) recently celebrated its 45th year with a continuing educating presentation featuring Dr. Alisa Haushalter, Belmont alumna and current director of the Memphis-Shelby County Health Department and luncheon for faculty, staff and alumni. The event, organized by Associate Dean for Nursing Dr. Martha Buckner, welcomed alumni from every decade of the School’s history as participants reconnected with peers and faculty and looked through memorabilia. The event also included several former faculty members and administrative leaders including former Dean and Emeritus Professor Dr. Debra Wollaber, former Associate Dean Dr. Chris Algren and former Undergraduate Director Ms. Kathy Jordan. The School also announced a few updates to the program with the celebration of its 45th year including the implementation of a new concept-based curriculum specially designed by SON faculty to promote critical thinking, compassionate care and essential skills needed in the workplace of the future. This curriculum change points to the School’s consistent commitment to remaining relevant and competitive in an ever-evolving world. Looking to the future, Taylor said the School of Nursing will continue to accommodate best practices driven by new technologies. 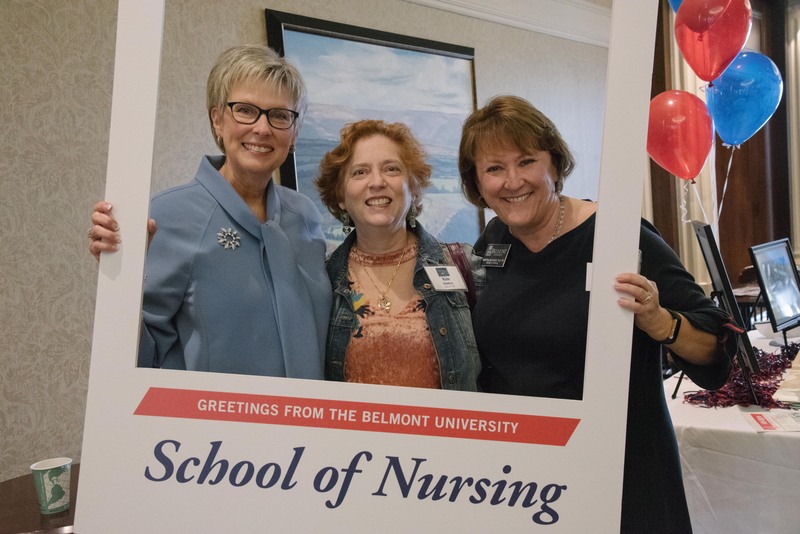 “Future graduates will be equipped with advanced processing and communication skills needed to manage these technologies, and while cutting edge technical skills will remain an expected baseline for Belmont nurses, future graduates will still be known for high ethical standards and care that is marked with a compassionate, human touch,” she said.